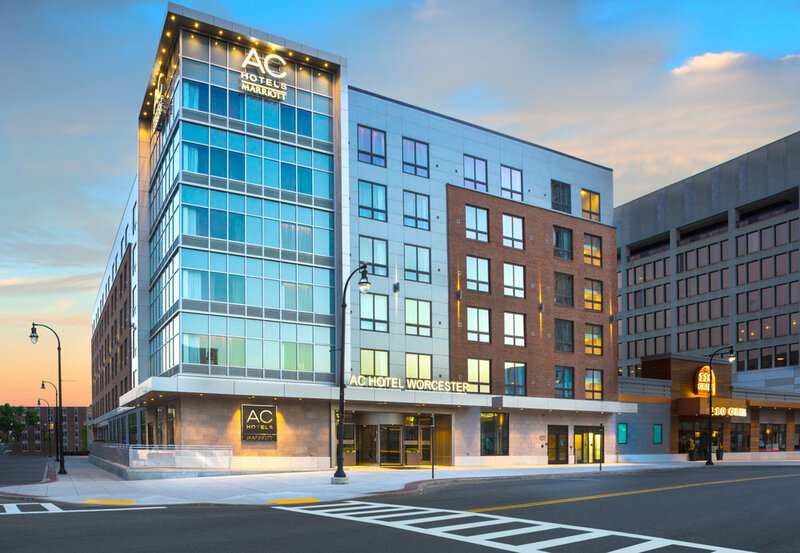 Located in the heart of Downtown Worcester and nearby Worcester Regional Airport, AC Hotel Worcester is easily accessible by way of I-290 and the Mass Pike (I-90). Whether you’re visiting WPI or one of the other local colleges or universities, catching an event at the DCU Center, or here to explore, you’ll find it all just minutes from the hotel. The 170 intelligently designed guest rooms and suites feature a flexible workspace, free Wi-Fi, and a 49" Smart TV. At the AC Kitchen, enjoy a European-style breakfast with freshly baked croissants, sliced meats, and made-to-order egg dishes. Unwind at the AC Lounge where bartenders with local expertise serve handcrafted cocktails that pair well with specialty small plates. Guests also enjoy a complimentary 24-hour fitness center, free Wi-Fi throughout the hotel, and a convenient business center. For meetings and events, the hotel offers dynamic space including smaller conference rooms and the large Wachusett Ballroom which can accommodate up to 760 attendees.